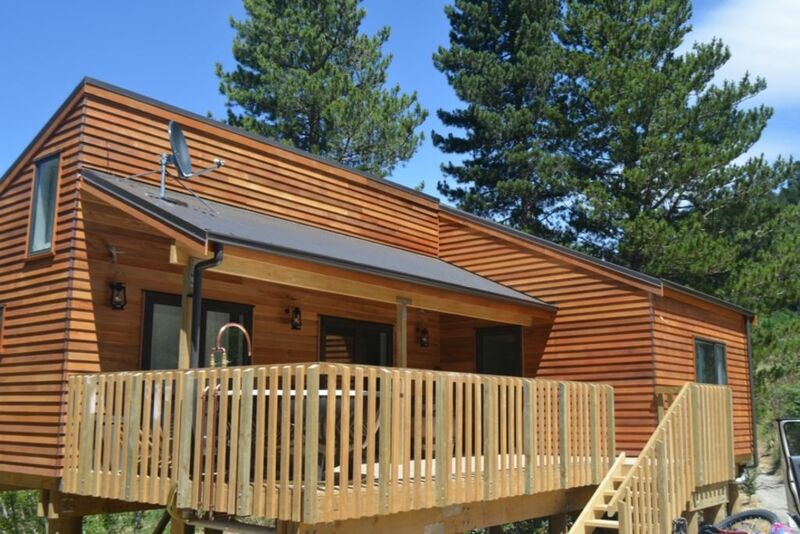 This newly built holiday home in Hanmer Springs is the perfect place to relax in the thermal pools, check out boutique shops and restaurants, bike and run the numerous trails or get amongst the thrill seeking activities. The Hanmer Tree House sits on 0.6450 ha in a unique location, surrounded by forest reserve. This property has the space to picnic under trees on the grass or to let the kids and pets run free! (Please note that it is not yet fully fenced - we are currently working on this project and hope to have it complete in the not too distant future). You are welcome to pop a tent up in the summer. It is quiet and private yet only a 10 minute stroll into the centre of town. There is an awesome private hot tub on the deck, with views to the mountains. The house also has a loft area with mattresses that kids love to sleep in. While it sleeps 8, it is best suited to a maximum of 5 adults. There are awesome walking and mountain biking tracks just over the fence (we have one adult mountain bike and some kids' bikes you are free to use). There are board games, a leapfrog tablet, 'rustic' bike ramps, a toddler playground and a hammock. Pets are most welcome but please keep outside of house. There is a medium sized dog kennel. NO PARTIES - Zero tolerance for parties, any wilful damage from parties will result in Police involvement and potential charges. Backs onto the Majuba walkway and a stone's throw to mountain bike tracks - free bike for use too! toilet, shower, Wonderful high pressure shower! One car park under the house which is on poles. Another car park outside on gravel. Huge section with a shallow creek running through it (often dry in summer). Surrounded by reserve land. Very private as no direct neighbours. Excellent place, great location! Highly recommended. Will be even better fully fenced. wonderful relaxing holiday. Loved the hot tub, the stars, the fire and the birdsong. Lovely rustic retreat. Plenty of room for 2. Great to have the fireplace and plenty of wood. Lovely place in surprisingly isolated setting but close to town. Only stayed 1 night but would choose to come back for longer stay if have the chance.